Those Polaroid transparencies are so cool! Gorgeous layout! Gorgeous, as usual! Love the layers. That bow is adorable. Beautiful layout! I love that paper. Love this layout!! Love all those little transparancies! I have some older ones in my stash, I really need to pull them out and get them in a layout or 2! Love that sketch and your LO! You are right, that Maggie Holmes collection is beyond cute! Amazing! I love how you used that PP as the background. I would be so chicken! 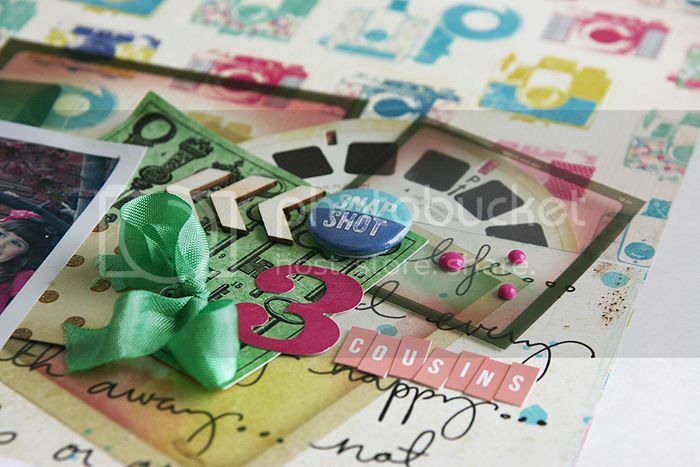 And I LOVE how you used the overlays and the layering...all of that yummy goodness and the photo is still highlighted! Love everything about this page Mary Ann!! The Camera paper looks awesome as your background! !